If you are a regular reader of this site then you will be aware of Gray Line’s affinity with the Washington National Mall. 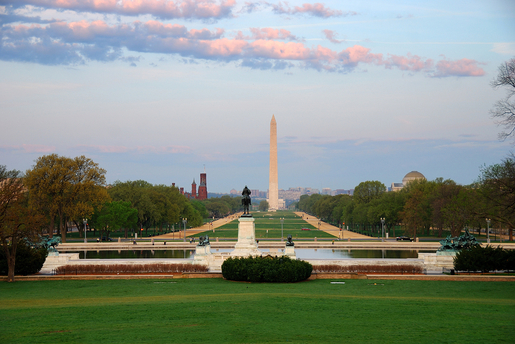 We love it as it attracts millions of tourists every year due to the accessibility of the Washington Monument and because of the brilliant views of our beloved U.S. Capitol. Early last week, members of the public were greeted with the peculiar sight of several scientists setting up a number of nets so they could catch a number of the mall’s flying habitants. These individuals have set up camp primarily to catch a number of birds namely gray catbirds, mourning doves and song sparrows. These specimens are caught and then released after scientists have completed their respective studies from their pop-up station which has also be erected to draw attention to this milestone anniversary in bird conservation as well as the upcoming gathering on bird science. The gathering itself is known as the North American Ornithological Conference and is due to take place here on the 16th August. This day conveniently falls on the 100th anniversary of the well-known Migratory Bird Treaty act which was implemented into US and Canadian law in 1916 and was seen as a revolutionary effort aimed at protecting birds internationally. In 2016 such international cooperation is required more than ever to protect birds as decreases in population for many species is a reality, putting many species of birds at increased risk. A spokesman for the Smithsonian Migratory Bird Center based in Washington noted that there had been up to a 90% reduction in the population of some species and the monumental task they now faced to help restore them. Many of these bird types move around six or more nations during the year which makes it difficult for any one country to sufficiently protect them. Overall the key issue is targeting the correct areas where the birds are most at risk. The main effective course of action is to spend time and resources on conservation efforts in areas that will prove most effective. This can be extremely challenging which is why the scientists that are currently situated at the National Mall are conducting studies with the aim of better understanding migration cycles and habitat patterns. Recent efforts to track migration, in particular, have resulted in micro trackers being attached to some of the birds. Using microelectronics has so far proved fruitful with these small lightweight tracking devices allowing for successful routing of some birds migration patterns. These minuscule trackers are sure to be a focal point of conversation at the conference and this method keeps providing new surprises and fascinating new data in the study of how birds migrate. Some of the more recent studies outline how fast some of the birds travel, as well as some of the astonishing detours that the birds can take if needed. Overall, the study on bird migration is ever growing and evolving and in general, we are actually just beginning to truly understand the staggering depth of information associated with bird migration. The DC scientists emphasized their desire to convert all this new data into meaningful and tangible action with the aim of having the bird population rise once again. Hopefully, their efforts are not in vain.